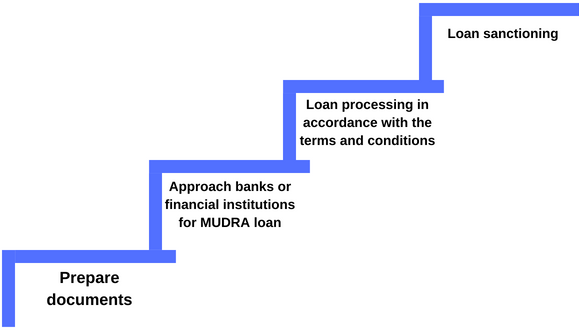 Micro Units Development & Refinance Agency commonly referred to as MUDRA is an institution set up by the Government of India which avails loans to SME's called as MUDRA loan. Announced in 2015 budget, the sole purpose of this establishment is the development and refinancing of micro-units. It has recognized the biggest bottleneck for Small and micro Entreprises (SMEs) in India. These enterprises face a lack of financial support from the formal banking sector, which hampers their growth. Thus making then ineffective at competing with large industry players. To remove this inefficiency, MUDRA banks have been established. Maximum cash limit for withdrawal is INR 25000 per day through ATM. The personalized card in the name of the firm. Insurance cover of INR 1 lakh is applicable on RuPay Card. From the first transaction onwards, transaction charges are applicable. One must note that MUDRA loan is provided under the Pradhan Mantri Mudra Yojna. The monetary resources are available in the form of a loan and not economic aid. The funding is made by the government on the condition that loans will not be free funds and interests will be charged to small businesses. Small businesses are often left to the market scrutiny. They are not included in the economic market of the country. The scheme is a boon for these businesses. 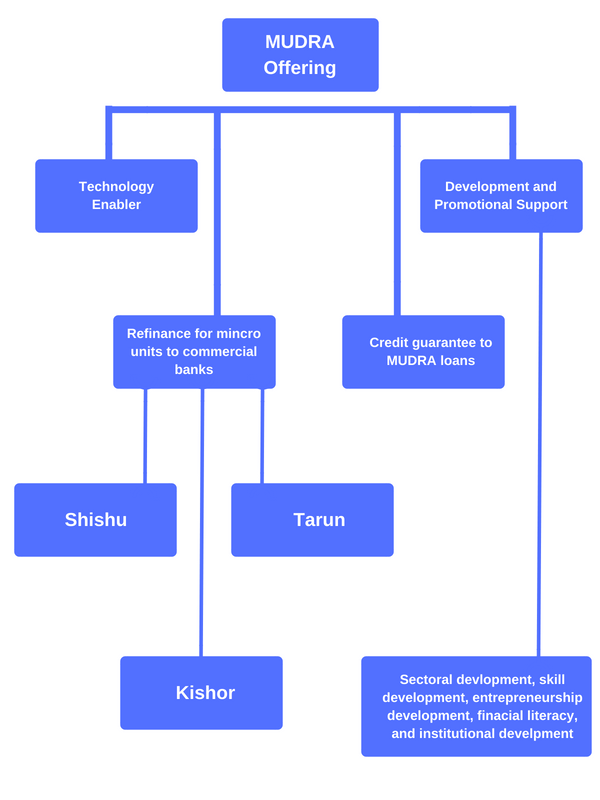 Shishu: covering up to 50,000 rupees loans. Kishor: covering loans from 50,000 rupees to 5,00,000 rupees. Tarun: covering loans from 5,00,000 rupees to 10,00,000 rupees. The interest rate is different for each of these categories and may vary between 10% to 16%. This signifies the stage of growth and funding requirements of the beneficiary micro units. The diagram below explains its hierarchy in a better manner. Once the application is made and the details are verified for eligibility, the bank will provide a MUDRA Card with the name of the applicant. The card is also linked to the saving account under the Pradhan Mantri Jan Dhan Yojana. The purpose of a loan must be an income generating activity. This means activities that are undertaken only for earning profits. This scheme is not extended for purposes other than business. Only on-farming business activities are covered under this scheme. This includes; handicrafts, repairs, household manufacturing, etc. The entities approaching MUDRA banks must be registered as MSME. Large-scale organizations are not considered eligible for the same. The proposed business plan presented should be within the financial need of INR 10,00,000 only. This is because the maximum amount granted under this scheme is INR 10,00,000. One must furnish a proper business plan before proceeding to finance the business. A loan application must be submitted under a selected category. Proof of identity, proof of address, and a passport size photograph has to submit by the applicant. No processing fee or collateral requirement for obtaining MUDRA loan. Proof of category like SC/ST/OBC/Minority. Quotation of machinery or other items purchased for business operations. SBI: State Bank of India or SBI is the most trusted government bank in India. Since MUDRA loan is a government initiative for small and medium businesses, the loan is provided at low-interest rates. The bank does not charge any processing fee for loans up to INR 50000. However, for loans over and above INR 50000 to 10 lakh are charged with a processing fee of 0.5% of the total amount borrowed. A vital point to note here is that a person is not required to keep a collateral under this scheme. The rate of interest is low if the business is operational for a long term. The rate of interest charged is less if the amount of loan taken is low. Further, EMI per month is big, then the rate of interest is less. The repayment period for normal business loans depends upon the EMI and the loan amount. For lesser EMI paid per month, one may opt for long-term repayment tenure. Punjab National Bank: The rate of interest applicable to MSME units is subjected to changes as per the norms of the RBI guidelines that are issued tome to time. Andhra Bank: Although, no collateral is required for taking a loan from here. The rate of interest applicable as per the current guidelines is 0.25%. The repayment is possible for a period of 36 months to 60 months at 0.50% for TVs. For TLs repayment can be done after 60 months, including the gestation period. Bank of Baroda: one of the primary features of this bank is that any that of fund based or non-fund based facility are provided here. There is no minimum amount, but the maximum amount of loan is fixed at INR 10 lakhs. There is no requirement of collateral security and rates of interest vary as per the amount of loan taken. Bank of India: This bank has its own eligibility criteria for giving MUDRA loans to women, proprietary or partnership concerns, or any other entity. The security is required in terms of primary security i.e. hypothecation of all assets and the personal security of the promoter and the director. However, there is no collateral security required. The rate of interest is linked to MCLR and varies from time to time. No processing fee is charged by the bank. One may choose between banks, depending upon the terms and conditions they offer on loans. One must enquire about collateral security, rate of interest, and repayment method before acquiring loans. The tenure of this financial assistance is based on the economic life of the assets created and cash flow generated. The refinance assistance is provided for a maximum period of 36 months. This is also aligned to terms of allotment of MUDRA funds as governed by RBI from time to time. Are you looking for MUDRA Loan Yojna in India? Legaldocs will guide you in getting all necessary Documents and Registration required to avail Mudra Loan Yojna in India, Please click on the following link to connect with our consultants.